The Ricoh Aficio MP C4500 is a full-color multifunctional system that supports copying, printing, scanning and faxing with several options for huge paper throughputs and expansion across a number of functions, if necessary. The copier measures 26.4" by 26.7" by 30" and weighs 287 lbs with the Automatic Reversing Document Feeder installed, which makes the unit too large and too heavy to realistically sit on anything but its own table or credenza and too short to be self-standing. The copier produces a respectable 45 pages per minute in black and white and 40 pages per minute in full color, well over the standard 20 pages per minute offered by many devices. This speed is consistent with the MP C4500's printer functionality, which works just as quickly. It has a standard paper input of 1200 sheets via two 550-sheet trays and a 100-sheet Bypass Tray, but this can be expanded to 3200 sheets by adding a large capacity tray to the copier. 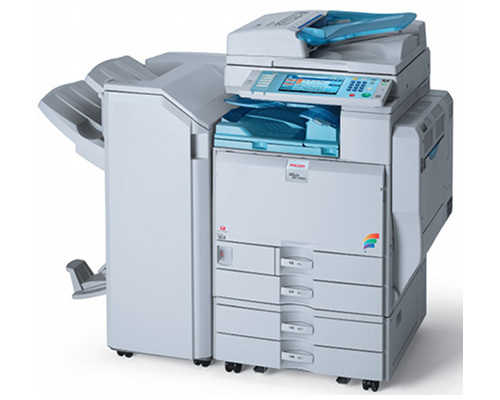 Its high capacity is further reinforced by the copier's ability to produce up to 999 copies at a time, well over what most consumer grade equipment can do. Its output capacity matches this, keeping 500 sheets standard, which is expandable with finishing options to 3625. 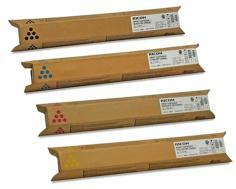 The MP C4500A can process paper in its first tray and the large capacity tray sized 8.5" by 11". Its second tray supports paper between 7.25" by 10.5" to 11" by 17" in size, and the bypass tray supports documents between 3.5"-12" in width and 5.8" by 18" in length (the largest possible document is 12" by 18"). Its largest source copy can be 11" by 17". The copier can reduce and enlarge documents between 25% and 400% moving in 1% increments, standard with most office copiers. The printer produces documents at a maximum resolution of 2400 dpi equivalent by 600 dpi, consistent with many other models like it. For connectivity, the printer includes 10/100BaseTX Ethernet and USB 2.0 support and includes optional connectivity via 802.11b, Bluetooth, IEEE-1284 Parallel, IEEE 1394 Firewire, and PictBridge USB Host interfaces. The built-in scanner processes documents on a glass flatbed or through the automatic document feeder at speeds of 63 images per minute for black and white and 38 images per minute in color. It scans monochrome images at resolutions between 100 and 600 dpi (1200 dpi using TWAIN) and full-color images between 100 and 600 dpi, less than what many photo printers produce but suitable for limited office applications. The scanner includes support for scan-to-email with LDAP, scan-to-folder via SMB/FTP/NCP, scan-to-URL, and network TWAIN scanning, and produces black and white images in TIFF and grayscale and full color images in JPEG format. The MP-C4500A includes 1GB of RAM. The included document server includes an 80GB hard drive shared between all functions. The optional fax system supports internet fax by email, IP fax, LAN fax, and LDAP. It can perform up to 2000 quick dials and 100 group dials at a time and supports PSTN and PBX circuits. It comes with 4MB of memory, expandable to 28MB, and communicates via a 33.6kbps modem. Documents transmit at approximately 2 seconds per page and at resolutions of 200 by 100 dpi to 200 by 400 dpi. Accessories include a 3000-sheet finisher designed to process large documents, a 2000-sheet booklet finisher, and a 1000-sheet finisher. Though the unit processes all documents in full color, its printing and scanning resolutions are well below those offered by higher-grade photo scanners and printers. Users who regularly work with high-resolution images will likely need another device to more accurately reproduce these. 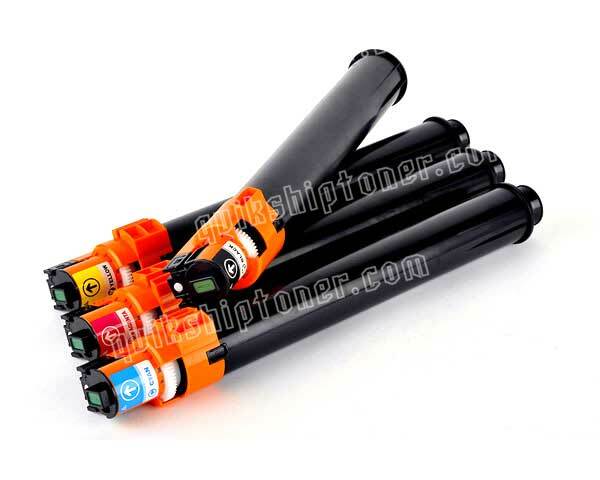 Review it: "Ricoh Aficio MPC4500 "
The MP-C4500a consumes four toner cartridges, all of which will require regular replacement in order to maintain printer function. 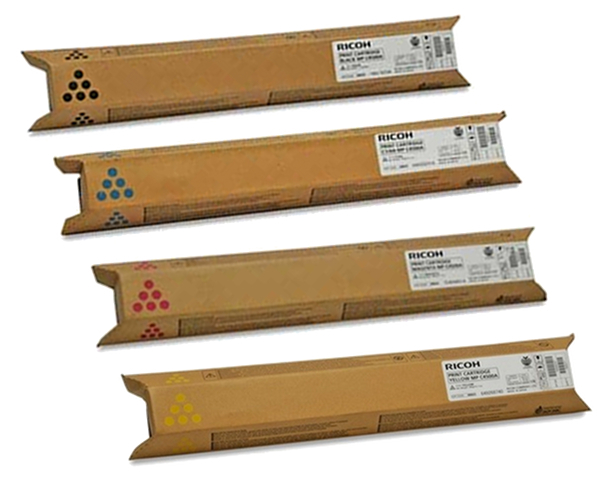 The black cartridge is measured at 23000 pages at approximately 5% coverage, and all three color cartridges - cyan, magenta, and yellow - require replacement at every 17000 pages at approximately 5% coverage.